Today we have a render to show off, but first we'd like to wish all of our fans a happy new year! We'd like to thank you all for your support over the last year, and for voting for us in the ModDB 2016 MOTY competition where we received yet another honourable mention! The M1941 82mm mortar or 82-PM-41 differed from the prewar M1937 82mm mortar in that it had the distinctive cone shaped baseplate and different bipod. This bipod allowed it to be fitted with removable wheels that greatly increased its mobility. These differences made it less steady when firing than the older design, and as a result it was generally less accurate. 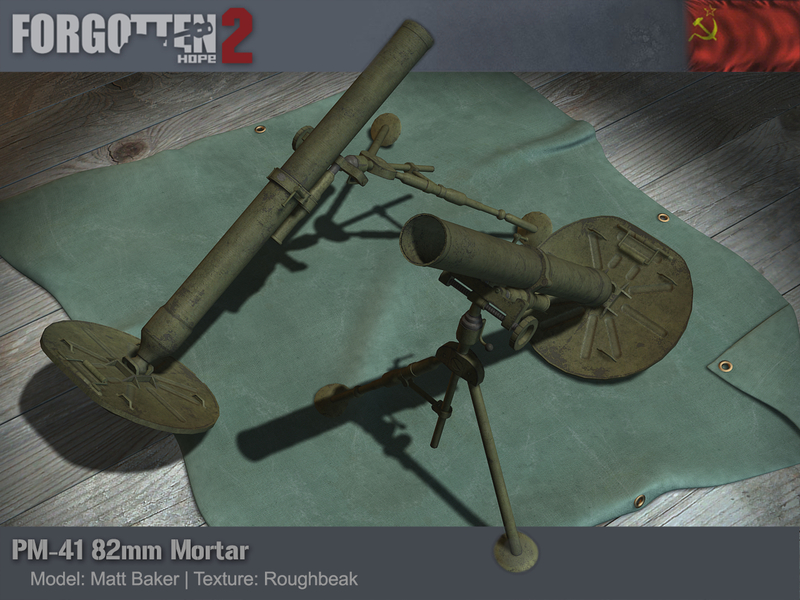 An improved M1943 mortar was eventually designed which fixed this issue, but all three models continued in use together. Our PM-41 was made by Matt Baker and Roughbeak.